Having gone 9 games unbeaten Welling were unable to make it 10 games as an in form Slough Town claimed a 1-0 win at Arbour Park. Despite the loss, results elsewhere confirmed a play off position, but Manager Steve King will have been frustrated they could not have further cement that crucial 3rd place. In a drab opening quarter the nearest either side came to opening the scoring came when Wings skipper David Ijaha sliced a clearance towards his own goal but Dan Wilks was alert and saved well. The Wings seemed to be struggling to adapt to the 3G pitch and it was Slough who had the chances albeit half chances at very best. George Wells flashing a free kick over for Slough from an acute angle. Billy Clifford then got in down the Welling left but his low effort was well saved by Dan Wilks. In the 34th minute Welling had their first chance as Mo Bettamer beat the offside trap but Slough goal keeper Jack Turner was out quickly to deny him with his legs. An uneventful first half almost came to light when a pot shot from George Wells was heading well wide but it hit Nunn and almost crept in but Dan Wilks was relived to see the ball go inches wide. Into the 2nd half and Lench got into the box but hit an angled effort into the side netting. 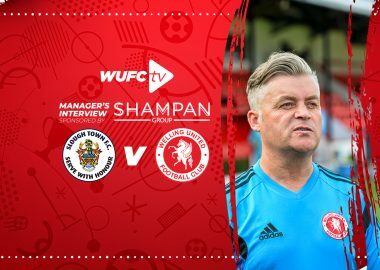 Welling then made a double change in the 50th minute as L’Ghoul and Bettamer were replaced by Luke Rooney and Bradley Goldberg. The double change seemed to help as Welling seemed more energetic and bright. However it was still Slough who were still having the half chances Billy Clifford bending a free kick just over the bar. Harris then had an ambitious effort saved by Wilks. In the 65th minute Welling had a great opportunity Kiernan wriggled his way into the area only to be denied by a superb last ditch tackle. The ball then made its way out to Braham-Barrett and Mills rose well but Turner somehow kept out his goal bound header. cleared to Billy Clifford who on the edge of the area took a touch and fired an effort through a crowded penalty area that took a deflection which alluded Wilks and went in. life and Goldberg hit an effort straight at Turner. In the 81st minute they spurned a glorious chance the ball was worked into Mills whose touch took him clear but he could only side foot his effort straight at Turner. It was now all Welling but they continued to huff and puff as Kiernan had an effort saved after a deflection took the sting out of his shot. The Wings had one last chance but Luke Rooney put a free kick over the bar as the unbeaten run came to an end. 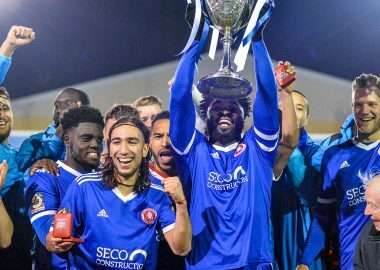 Welling will respond like the last time they tasted defeat and produce another undefeated run.